Beleela Shopper promises shopping offers and useful coupons. If this program were truly beneficial, we would not be discussing it. Right when this program was brought to our attention, we quickly analyzed it in our internal lab, and we found that it injects third-party advertisements that might be unrelated to shopping at all. EIPC Software DWC-LLC is the developer of this adware (advertising-supported program), and it has set up beleelashopper.com to represent it. Even though the website is up and running, the installer does not work; however, that does not mean that this adware is no longer adware. If it is still active on your PC, please continue reading to learn how to delete it. This report reveals the reasons why the removal of Beleela Shopper is important. Since it is impossible to download Beleela Shopper from its official website – at least at the moment – other methods of distribution must have been employed. The installer in the Chrome web store has been taken down as well, which leaves software bundling as the most likely method of distribution. It was found that Google Chrome is the browser targeted by this advertising-supported program. If you have found this suspicious adware installed on other browsers, we will help you delete it from them as well, just let us know you need additional removal instructions in the comments box below. This app is introduced to you as a browser extension, and you can find it in the chrome://extensions/ menu. In the worst case scenario, this extension will be installed without your permission along with much more malicious infections. This depends on the installer you use, and so if you do not want to let in malware yourself, you have to be extremely careful about the installers you trust and execute. 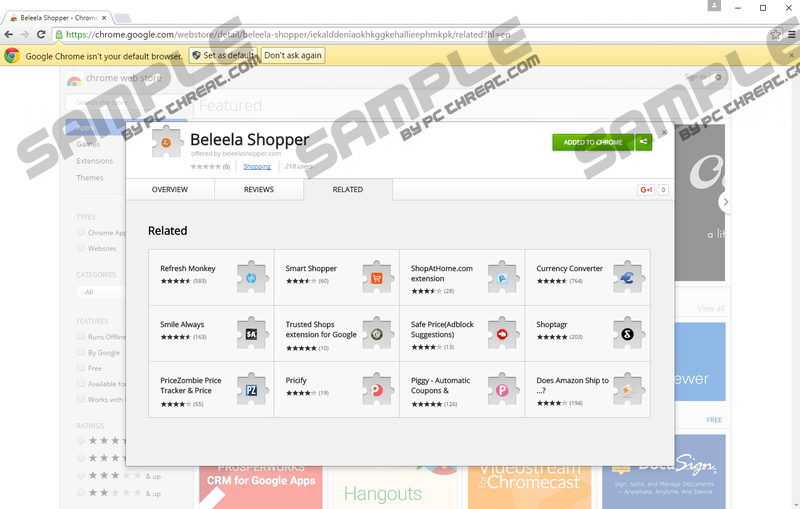 Once you install Beleela Shopper onto the computer, sooner or later, you will start seeing ads. Although you might expect ads to show up, considering that this adware is promoted as a shopping assistant that is meant to provide you with deals, the ads shown by it can be very unreliable. Our research has revealed that this extension can display pop-ups urging you to install suspicious software. For example, you might be asked to download a supposedly necessary update or a video/media player. Unfortunately, it is unlikely that you will be provided with authentic installers. It is much more likely that you will be exposed to fake installers hiding malicious infections. Do you want your PC flooding with malware? If you do not, stay away from suspicious installers promoting unfamiliar programs. Note that, in some cases, the logos and names of familiar programs could be exploited to trick you into installing malware. Our researchers warn that Beleela Shopper is likely to be used for the collection of information. This adware could be implemented to record your browsing history. Although this might seem harmless, you must keep in mind that information regarding your activity could be used to create more successful scams. This is another reason why you must eliminate this ad-supported program from your computer as soon as possible. If you have already interacted with the offers and the installers provided, you should first scan your operating system to see if other threats have been infiltrated. Depending on the findings, you might have to adjust your course of action. Of course, ultimately, you need to delete all threats that are active on your operating system as soon as possible. You can delete Beleela Shopper from your PC using the instructions below, or you can implement an anti-malware tool that will erase this adware along with all other threats automatically. Needless to say, this option is much more advantageous, and we recommend it to all users. However, if you have decided to eliminate existing malware and adware manually, do not forget to use a malware scanner to detect active threats. Because malicious threats can conceal themselves, you should not rely on your own research when it comes to the detection of malware. We advise researching every threat found, and you can use our database (search for articles using the search box) to learn how to eliminate every single one of them. Launch Explorer (simultaneously tap Win+E). Type %LOCALAPPDATA%\Google\Chrome\User Data\Default\Extensions (or %UserProfile%\Local Settings\Application Data\Google\Chrome\User Data\Default\Extensions\ if you use Windows XP) into the address bar above and tap Enter to access this directory. Right-click the iekalddeniaokhkggkehallieephmkpk folder and choose Delete. N.B. The Default folder might be named after your Chrome Profile name. Quick & tested solution for Beleela Shopper removal.